Visiting the Louvre can be tiring particularly when you try and take in too much at a time. When your feet are aching and you’re hungry, you want to find a place to relax that’s hassle-free and has friendly service. As a rule, it’s always best to have your main meal in France at midday because many of the restaurants offer excellent specials that are no longer on the menu in the evening as they cater to local businesses. My all-time favourite in good weather is in the Tuileries Gardens. I used to imagine it would be expensive and full of tourists. Not so. There are tourists, of course, but a lot of business people and office workers as well. 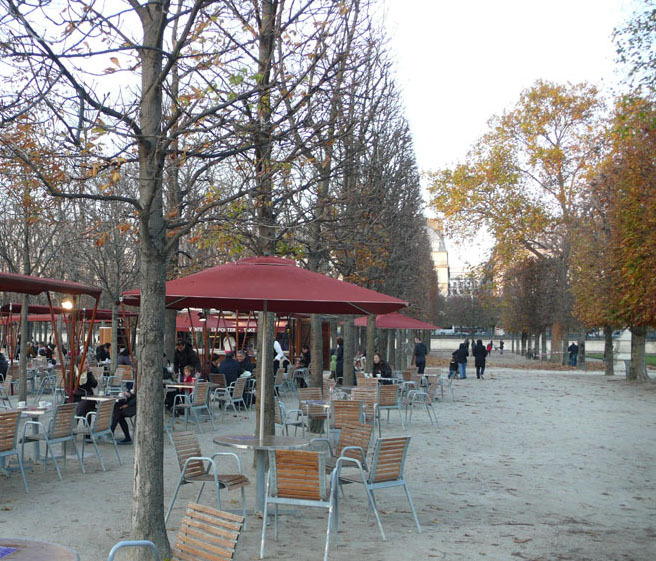 I prefer Café Diane, the first outdoor restaurant you come to on the right when you walk from the Louvre towards Concorde because the waiters are very friendly. On a hot day it’s wonderful to sit under the trees and take in the splendid and unrestricted view of the Louvre and gardens. There’s quite a big turnover so you never have a problem getting a table but you can still stay as long you want. There’s a choice of salads, quiches and a hot dish of the day all for around 11 to 13 euros. The food is cooked on-site and even when it’s very busy, the service is fast. Great too if you have a baby in a stroller or someone in a wheelchair. There are some sparkling clean public toilets (50 euro cents) over towards Rue de Rivoli. Open every day, same openings hours as the gardens. However, if the weather isn’t too wonderful, you might prefer to be indoors or on a covered terrace. 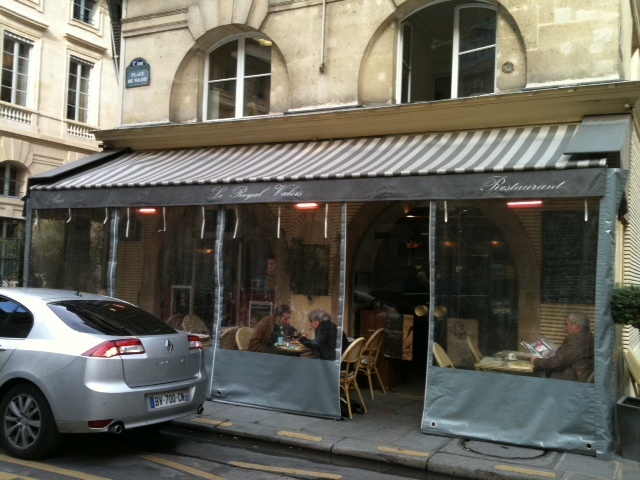 Put your back to the river and go towards the Palais Royal. Turn right into rue Saint Honoré and walk past the strange building on your left covered with a silver metal net (Minister of Culture) and then left into rue Croix des Petits Champs (not to be confused with rue des Petits Champs). On the next corner on your right, you’ll find Café Louise. This is a little restaurant mainly used by people working at the Ministry but Louise, her daughter Lilie and the Indian waiter all speak English and the service is warm and friendly. 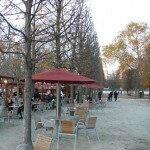 A bit more expensive than the Tuileries Gardens but good value for money and the food is always very fresh. We prefer the lobster salad and souris d’agneau (lamb shank). Excellent desserts made by Lilie. This is our local restaurant. Open from 12 to 10 pm weekdays. Closed in August. NOT TO BE CONFUSED WITH LOUISE JUST OPPOSITE THE LOUVRE. A little further down on your right is the Galerie Véro Dodat, one of the first galleries in Paris to have gas lighting. There is a little restaurant called the Véro Dodat about halfway down (not to be confused with the Belle Epoque at the entrance). It’s an excellent compromise if it’s raining or cold but you don’t want to eat indoors. They have a set menu at € 16.50 or € 13 for a main course. French cooking, fresh produce and good value for money. It’s worth going to the Ladies or Gents upstairs to have a closer look at the top of the arcade and the frescoes. Friendly service once again. Midday weekdays only. Closed in August. Another possibility is the Royal Valois, which also caters to people working at the Ministry. With your back to the Louvre and the Conseil Constitutionnel in front of you, you take the street on your right, Rue de Valois. The Royal Valois is on the next corner. It has a heated terrace and two rooms inside. Very fresh products and friendly service. 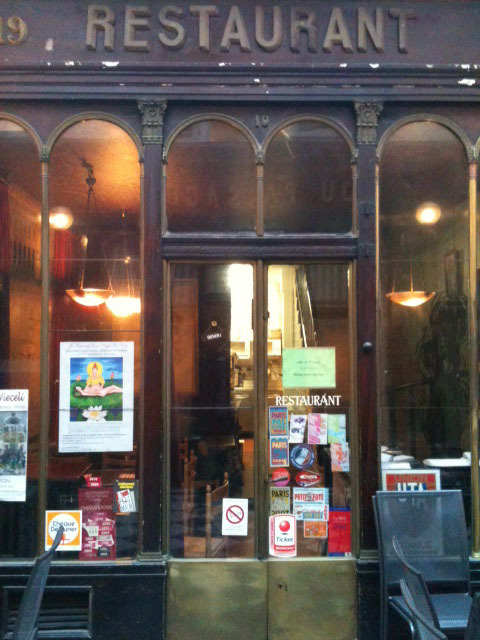 Excellent value for money with the day’s special at 14 to 16 euros, salads at 14 to 15 euros and hot dishes at 15 and 16. Open from 7 am to midnight weekdays. They speak English. Closed in August. 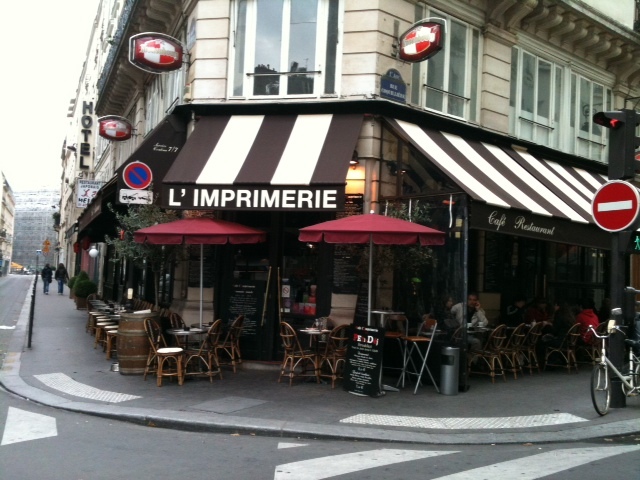 If it’s the weekend, however, Louise, the Véro Dodat and the Royal Valois will be closed so you can try Café de l’Imprimerie. 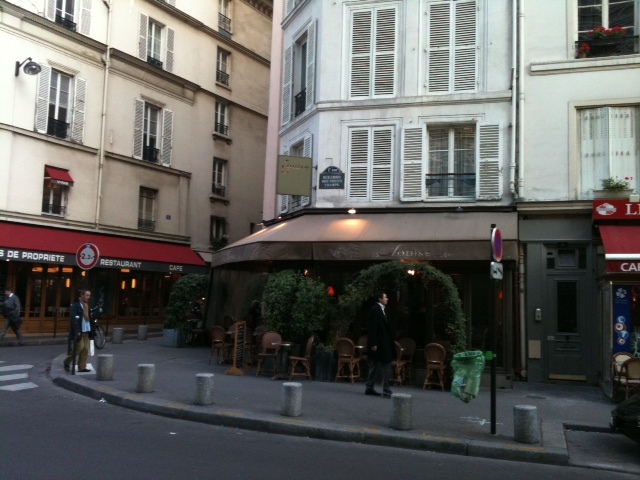 From the Véro Dodat gallery, you continue walking down Rue du Bouloi, then cross Colonel Driant ; Café de l’Imprimerie is on the left on the next corner. It has a heated partly-closed-in terrace on one side and an open terrace on the other. They have an interesting range of salads including a good stir-fry vegetable dish (wok de légumes) and vegetarian lasagna, both for about 13 euros. The food is good and the service is friendly and helpful. Very popular with the locals. 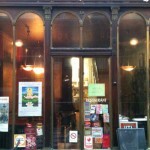 Open from 12 to midnight on weekdays and weekends with brunch on weekends. 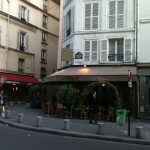 This entry was posted in Paris, Restaurants and tagged Café de l'Imprimerie, Café Diane, Café Louise, restaurants in Paris, Royal Valois, Véro Dodat. Bookmark the permalink. 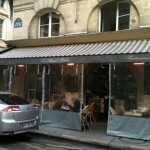 Know of any good “salon de thé” near Musée Jacquemart André? When I worked at Decathlon near Madeleine, a co-worker and I would grab a baguette, some cheese or ham and fruit and then go the the Tuilieries Gardens to eat lunch. Thank you for this informative post, Aussie in France! Last night we had a terrific meal at Cafe Louise — it’s exactly as you described it and we were delighted with the food, service, atmosphere, and value for money. We will definitely return and now look forward to trying the other places you suggest in this post. Thanks again for sharing this helpful info. Hi Carolyn, I’m so glad you enjoyed it! It’s wonderful to be able to share our favourite places. 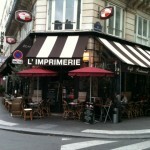 SLOWLY I’m getting my act together and gathering ideas for nibbles and swigs within steps of the Louvre — all YOUR idea. So clever. Will hyperlink back to this wonderful post once it’s up and running. Thank you for the above wonderful list in the meantime.